I like to accessorize my outfits. I have various accessories, especially jelweries. Depending on the occasion, time of day, and outfit, I choose different accessories, and I like to be able to do that when I travel as well. But safety is really important to me when traveling, and I want my jewelry to be safe – and for me not to be stressed about what’s happening to them. So, after many travels with no problem (well… with a very small one when I lost an earring – not stolen, lost, as you’ll see below), here are my top travel tips on how to travel safely with jewelry. You most likely have several sets, earrings, bracelets, etc. And you like some more than others. And you’d like to bring enough jewelry with you to be able to match it with your different outfits or times of the day. But you know what? You shouldn’t do that. You have to take as few pieces with you as possible. You should always ask yourself: do I really need this? Can I travel without this? 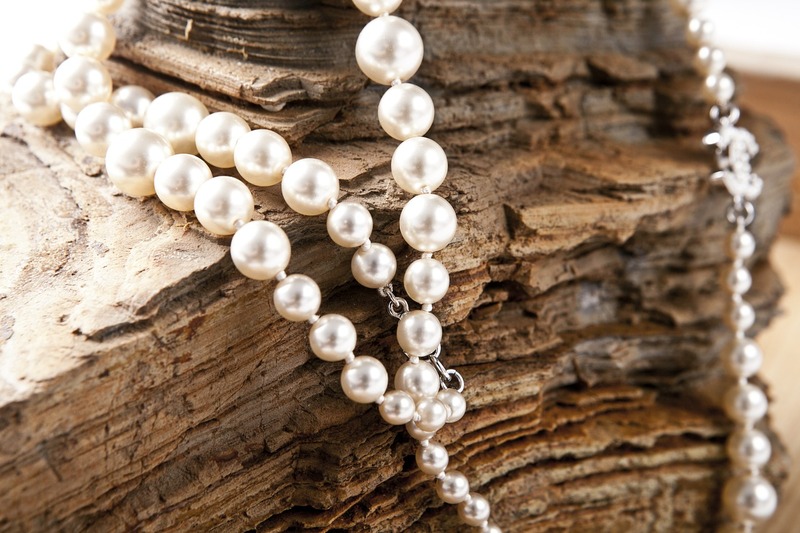 Here are some more tips on how to choose the jewelry you take with you on a trip. Like I said, you only need a few pieces. You will be able to pack them easily and you’ll be able to keep them safer. Choose a single set, a separate 1-2 pair(s) of earrings, and maybe, just maybe, a bracelet. Don’t pack expensive jewelry. You’ll end up worrying more – and, you’ll catch thieves attention. You don’t need those expensive diamond earrings or that flashy ruby ring on the beach. Or while hiking. Really. As another tip from experience: Though I love wearing a necklace, while traveling I only usually bring, now, a ring, my wedding band (which I am not removing or replacing it), and 1-2 pairs of earrings. I used to pack a set – aka a necklace, a bracelet, and matching earrings, but frankly just the 2-3 jewelry (mentioned above) are enough. Another tip: Choose silver or fantasy jewelry. Easier to keep them safe! This minimizes the risk of loosing your favourite jewelry. And this is very important and you don’t have to think only that your jewelry might be stolen, but also that you might lose it: forget it on a night stand or in the water (if you go swimming) or having an earring that might fell at some point. I lost an earring at the seaside one year – not swimming, just didn’t closed it well enough or it didn’t stay closed due to a defect, I don’t know. I was sad – fortunately not the most expensive jewelry – but it was a pair of earrings that I loved and with a blue color that I didn’t manage to replace very soon. Lesson learned 😀 – see below. Actually, the best tip I can offer you on this topic is to take with you the jewelry you are prepared to lose. Yes, take those jewelry that you wouldn’t cry over, or have a hard time replacing them. Don’t take jewelry with a sentimental value with you – even if they are not expensive, if stolen/misplaced, even if you replace them, they will never be THOSE jewelry, those pieces received as a gift in a special occasion or those reminding you of a precious moment. You like matching jewelry to your outfits? So do I. But when I travel I rarely take something colourful with me. I take something neutral – silver only or with a white or transparent stone. That type will match any outfit! For a colour touch, as I already recommended above, pick some fantasy jewelry – something that you won’t feel bad if loosing. Or that isn’t so expensive and you could easily replace. And only if you really need it! OK, so you’ve decided what to pack. But how do you keep them safe while traveling? 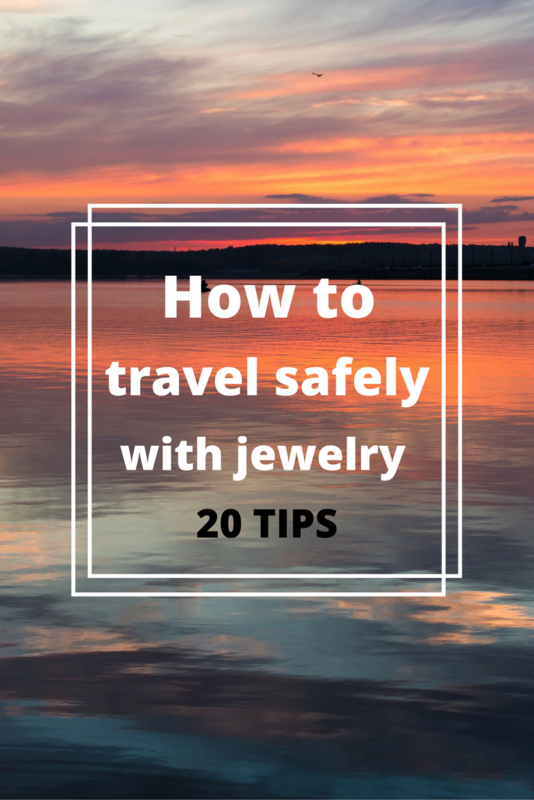 Here are other travel tips to help you traveling safely with your jewelry. You should travel with a special jewelry box/bag/organizer. I had a small wooden box I used – as it keeps the jewelry safe, without risking it to have an accident while traveling. Also, keep them well organized – so that you get to travel travel jewelry without tangling. Use plastic/velur bags to separate small pieces (earrings, rings). Use straws for necklaces (I saw this at a friend, I never had to use it as, when bringing a single set with a necklace, it was all OK). Or pick a jewelry box with separators (I have a small one, perfect for my traveling needs). Nowadays, I have to be honest, I use my make-up purse as a jewelry purse as well. Yup, 1-2 eye crayons, a small make-up set with the colours I use daily – neutral, grey, or blue/green – and those few jewelry pieces, and that’s it! Keeping all jewelry in one place will also help you keep track of them. Of course, the less jewelry you bring with you, the better. But you should definitely be able to know, at all times, what did you bring and where those pieces jewelry are. Where to keep this jewelry box? Well, this is a tricky question. At first, I would have said have it in your purse. But actually, it depends on how you travel. And how many jewelry you carry with you. And… well, here are my travel tips and experience. I now keep that jewelry box in the checked baggage. Yes, not in my carry-on. BUT, now, to protect our travel bag, we always wrap it – it’s that wrapping service in a plastic foil at airports. We pay extra, true, but the travel bag stays in a great shape for a longer period and we don’t risk it being opened. When flying, I also don’t recommend taking off your jewelry. No airport security asked me to do that. When traveling by car – which we also love – I usually put that jewelry box in a bag in the trunk. As we don’t travel by car in places or countries where we risk our car to be broken into or stolen. True, you may never know, but we try to be careful. With train travel it’s easy as the baggage is always within my sight and reach. Jewelry usually goes into my purse – if there is room – if not, as always, baggage. After checking-in, if your room has a safe, use it wisely, young Jedi. Joke aside, use that room’s safe to store there your precious belongings. This means that if you go out without your camera, and if it fits in that safe, you should put it there. The safe is the perfect place to keep jewelry while traveling and being outside. Just make sure to check the safe before leaving the hotel so that you don’t forget what you stored there. While I don’t recommend traveling with valuable jewelry, if you do that, I think that it is a great idea to have insurance. I mean, a gold diamond ring or set should be insured. It’s for your own protection – even if you hope to never need that insurance. It’s better to be safe than sorry, right? Finally, while enjoying your vacation, stay alert. If you are constantly looking at your phone or seem as if you pay attention to nothing, you become a target. And not only for jewelry thieves, but for any thief. Don’t take off your jewelry – for instance, don’t put a ring or a bracelet on the table. Have them on you. Also, don’t wear flashy, tempting jewelry in bad famed neighbourhoods. I’d always recommended avoiding those places, but if you go there for various reasons, don’t draw other’s attention, especially not with expensive jewelry. Well… that’s all folks! 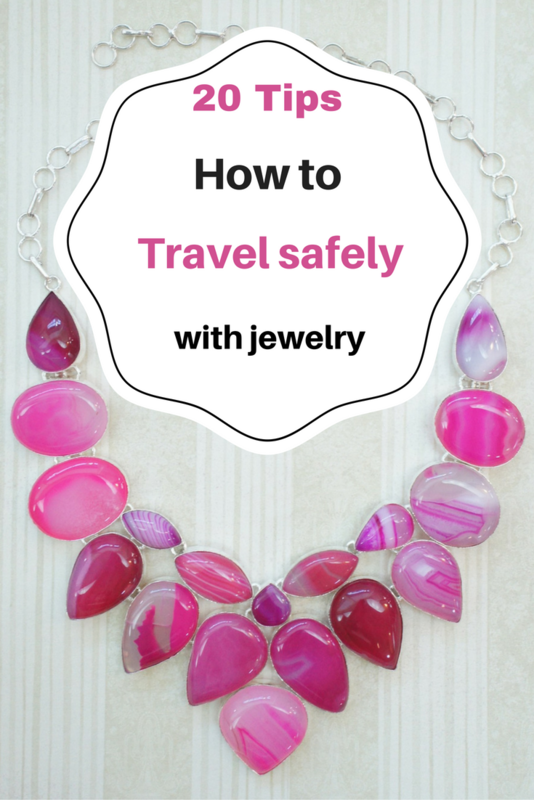 These are my safety tips on how to keep jewelry safe on your trips. I hope they help you and please tell me if you have other tips and tricks you use when traveling! For the love of god please leave them off. They are loud and annoying and make it hard to hear announcements and stop notifications. If you do turn them back on at least make them silent. In my dreams, my lion is white or invisible, and I call him The Professor as he sometimes shape-shifts. He is never scary or threatening, instead, he is my protector and teacher. He often asks me questions, sphinx-like, to guide me in the direction I should go or help me find the answers I’m seeking.